Home » Ashura » Hussain: What’s in a name? Hussain: What’s in a name? The name “Hussain” is a young child sitting in a crowded mosque and seeing her parents cry for the first time at the tale of a far-off event that seems impossibly remote. It is emotional, black-clad multitudes in grim processions, shaking with sorrow for the household of the Prophet killed nearly fourteen centuries ago. Hussain is an emotional connection to one hot morning in a small stretch of land in modern-day Iraq that is strong enough to reinvigorate our belief, animate our heretofore muttered prayers, and galvanize our characters. This connection is resilient enough to withstand the erosion of time, the varying tempos of cultures, fourteen hundred years of oppression and ridicule. Hussain, the grandson of Muhammad, the Prophet of Islam, was brutally killed in 680 CE in what is now Iraq by the armies of the Umayyad caliph Yazid. 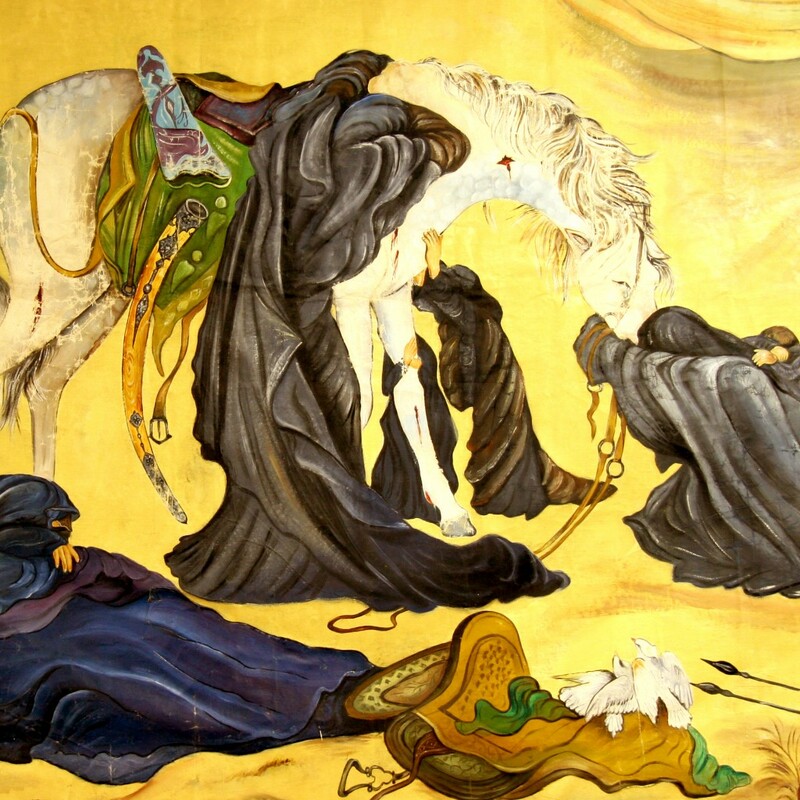 Because Hussain carried a moral and spiritual authority due to his connection with the Prophet, his spotless character, and his role in early Islam, Yazid wanted Hussain’s pledge of allegiance to formally recognize him as Caliph and thereby imbue his policies with Hussain’s stamp of approval. Knowing Yazid to be an immoral and cruel leader, Hussain refused to lend the Caliph his moral authority and thus had to leave his hometown to avoid threats. The Umayyad army followed him and cornered his caravan of family and companions in a land called Karbala. There, they were issued an ultimatum: if Hussain did not pledge his allegiance to Yazid, he and his companions would be killed by the waiting army. After an uneven battle where the caravan of faithful men was decimated, the women were taken as captives and humiliated by the troops as they were dragged across the cities of the empire to show the putative power of its leadership. Hussain is the inspiration to choose the moral option even when the entire world is against you. Before Hussain left his home, the people of Kufa, a city near Karbala, heard about the political atmosphere and invited him to come to Kufa for protection from Yazid’s machinations. Once Hussain was en route, they, too, were intimidated. Feeling alone and supported only by a handful of companions against the might of an army and the apathy of empire, would it not feel enormously difficult to take on the luxury of a moral stand? Yet Hussain’s decision did not waver as the odds grew even more grim. Hussain is the lone voice of conscience that rings strong at the approaching menace of immorality and injustice. He is the reminder that it is each individual’s responsibility to stand up to corruption, no matter how isolating that may feel. It is easy for a weak-minded individual like myself to justify away the moral responsibility of allegiance to Yazid by dismissing the end result as remote and unconnected from my actions. Recognizing the implications of standing with a corrupt ruler, Hussain decided that his life was not worth the evil he would take on his soul by protecting himself. Hussain represents the idea that it is vital to stand up to any immoral authority, great and powerful though it may be, and speak up for the truth, even if alone. Hussain is the clarion call of faith spurning reliance on any being other than God. His unwavering stance was that of a man undaunted by the threat of death, eager to meet his Creator, wanting only to defend his grandfather’s community from degeneracy before he was killed. Even as the opposing army was killing his family members, Hussain spoke to them, striving to make them understand the monstrosity they were committing by partaking in this unjust battle. Hussain is the shining parable that there is no fear for a human who always puts closeness to God foremost. Hussain is the exemplar that popularity is transient, that what modern society may judge as victorious bears little value. While we are blessed with the hindsight to recognize that of course Hussain was the victorious one, that was not the clear or popular opinion in the months and years following the battle. As Martin Luther King said, “right, temporarily defeated, is stronger than evil triumphant”, and Hussain reminds us to hold steadfast to right, even when it is defeated. Hussain is the hand lifting our blindfolds to recognize that what we are told is popular and good and important may not necessarily be so, to examine at the injustices committed within and by our society. Hussain is the vision by which we distinguish between truth and falsehood. On the battlefield of Karbala, Hussain called out to the opposing army, warning that the flimsy baubles and promises of wealth they had been offered as a reward would ultimately be of no use to them. His is the character that altered the fate of a general in the opposing army, allowing him to see that he was in company of the accursed ones of the Hellfire and escape from their clutches to the small band of weary defenders that were the true denizens of Heaven. Hussain is the believer who was in awe of God’s myriad blessings and constantly on the God-fearing path. He is the servant of God who gave all he had to fight an iniquitous leader and preserve Islam. Salutations upon Hussain, the children of Hussain, and the companions of Hussain. Batool Ali is a New York based community organizer & software engineer. She also gives talks at on community and religion in her spare time. Beautiful piece! Resonates so deeply in my soul. Every 1st of Muharram feels like coming home and this post captures that so well. Thank you for these words, Batool!